5 Benefits of Blackstrap Molasses For the Hair | Eat This! 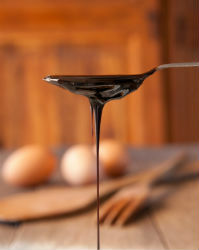 Blackstrap molasses contains manganese, a potent antioxidant. It is also loaded with antioxidant chemical compounds known as phenols. Antioxidants can contribute to good hair health because they fight free radical activity and oxidative stress, which assists in the proliferation of many different symptoms of premature aging, including gray hair and hair loss. Anecdotal evidence suggests that taking blackstrap molasses can help to slow and even reverse the proliferation of gray hair. One tablespoon of blackstrap molasses contains over 20% the DV of copper, which is essential for hair pigmentation. It is believed to cause gray hair to fall out and be replaced by healthy hair of one’s natural color. The vitamins, minerals, and antioxidants that blackstrap molasses contains all contribute to the strength and thickness of the hair. While it can’t change the hair that’s already on your head, it may help to improve the strength of new growth.